Are you a budding or established artist looking to make your work accessible to a wider audience? Museum grade fine art prints are a great way to offer your original artwork in limited edition runs. Our service includes digitising and colour matching your original. The master file is retained by you for future print orders. This guarantees colour consistency across multiple print runs. Reproducing your artwork as archival fine art prints. Original works of art are a precious commodity, precious and often expensive (and rightly so). On many occasions, offering a fine art reproduction proves more accessible and can encourage interested viewers to make a purchase. The problem this creates is ensuring the reproduction is an acceptable duplicate of the original piece of art. Original artwork can be digitised by scanning on our Imacon 949 scanner or professionally copied using a Phase One back (medium format digital capture). In many instances the Phase One copy offers a better result, as larger pieces and artwork which is mounted or uses thicker materials (such as an impasto oil painting) can be digitised. When ‘more or less’ won’t do. Following digitisation, colour matching has to be the top priority. This is acheived by viewing the original piece of artwork in lab, carefully correcting the digital file to match the original as closely as possible*. Originals are viewed under daylight balanced lighting (which provides a stable and neutral colour temperature) to ensure what we see is the correct colour. Our fully colour calibrated computer and print system greatly reduces the differenct between the original and what appears on screen. Fine art / giclée prints are becoming more popular. CC Imaging prints Giclée Fine Art at A0+ on archival Rag. Your giclée print will last 75 years, which is fantastic news for artists offering reproducton prints. Artwork can be printed at a variety of sizes which creates the opportunity for greetings cards, wedding invitations, smaller framed prints or large wall display prints. Many artists who use our reproduction service have expanded their target audience by offering reproductions in this way. As recommended by those in the know. We are a Hahnemühle certified studio. When it comes to colour accuracy and consistent high quality output we can attain no greater accolade. Trusted to carry the Hahnemühle brand guarantees our colour managed workflow from input to finished print. 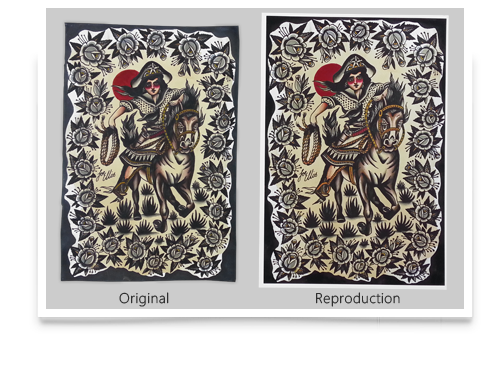 Digitisation of your original artwork. Image colour matching to your original artwork. A ‘ready to print’ file on CD, colour profiled and sized. Price depends on size of original artwork.